When planning a vacation to a destination outside of Europe, travel health is probably near the bottom of the priority list. However, your well-planned vacation could go haywire unless you take adequate precautions against travellers' diarrhoea. As the name implies, it is a scourge that affects people who travel to most tropical countries in Africa, Asia and Latin America. Tropical strains of bacteria are the main culprits; they mostly affect visitors from developed areas of the world, like the US and Europe, who have had no previous exposure. Local residents, and frequent travellers who are already exposed to these microbes, are generally immune to them. While 80% of the cases are due to bacterial infection of the upper gastrointestinal tract by E. coli, Salmonella, Campylobacter or Shigella, some viruses and parasites also can be the cause. They get into our digestive system through contaminated food and water. Travellers' diarrhoea is caused by a bacterial infection from ingesting contaminated food or water. This is generally due to poor food hygiene and most commonly affects raw or undercooked meat, seafood, and raw fruit and vegetables. Tap water, including ice, and dairy, especially unpasteurised milk, are also common causes of travellers' diarrhoea. For further details on the causes of travellers' diarrhoea and information on how to prevent them, see ‘Prevention’ below. What are the symptoms of Travellers' Diarrhoea? Up to half of European travellers abroad to developing areas, including South America, Africa, the Middle East, and Asia, will experience travellers' diarrhoea at some point during their trip. It usually occurs within the first week of arriving in the country but can occur at any time. As well as loose, watery motions, the symptoms of travellers' diarrhoea can also include nausea, bloating, stomach cramps, and vomiting. It has the potential to ruin a trip, however it is rarely serious in itself with dehydration being the major risk. It is therefore important to drink plenty of clean water and rehydration sachets to keep hydrated, especially in hot climates where dehydration is a greater risk. On average travellers' diarrhoea will last around 3 days but can persist for over a week. Fever above 38.5 degrees centigrade. Diarrhoea lasting over 3 days, especially with treatment. How dangerous is Travellers' Diarrhoea? While it has a very high potential to spoil your vacation, most cases of travellers' diarrhoea are self-limiting and usually cause no serious or permanent damage. It may tie you to a restroom for 2-4 days or even keep you in bed with symptoms such as stomach cramps, nausea, vomiting, headache, fever and fatigue. Re-hydration therapy is usually sufficient, but antibiotics may be necessary to clear up some bacterial infections, especially if fast relief is required. If it is caused by parasites, diarrhoea may persist. Persistent diarrhoea lasting longer than 3-4 days or not responding to treatment should be treated by a doctor. In about 10% of cases, it may lead to chronic irritable bowel syndrome. The Independent Pharmacy is able to provide a Travellers' Diarrhoea Treatment Pack to those who are going on holiday to at-risk destinations. It contains an antibiotic, anti-diarrhoeal medication and rehydration salts to treat your symptoms, cure the infection and keep you hydrated so you can make the most of your trip abroad. How do I treat Travellers' Diarrhoea? Some simple cases of travellers' diarrhoea can be treated with over-the-counter medicines such as loperamide (Imodium) and rehydration sachets (Dioralyte). These will help to ease the symptoms whilst your body fights the infection. It is important to drink plenty of fluids to avoid dehydration - this is the most dangerous consequence of travellers' diarrhoea. For more severe cases of travellers' diarrhoea, antibiotics may be required to treat the infection. The Independent Pharmacy is able to provide eligible patients a course of ciprofloxacin, azithromycin, or rifamixin as part of our Traveller's Diarrhoea pack. It contains one of the antibiotics (ciprofloxacin or azithromycin - depending on your destination) for the treatment of travellers' diarrhoea, as well as loperamide capsules and rehydration sachets. This allows you to treat the infection causing your travellers' diarrhoea, ease the symptoms and prevent dehydration. If you are travelling to South Asia (e.g India) or South-East Asia (e.g. 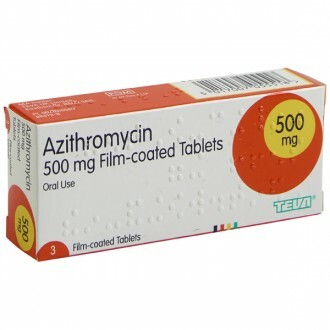 Thailand), you are recommended to take azithromycin as this may be more effective in treating travellers' diarrhoea contracted in these areas. 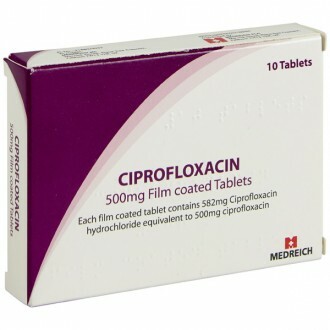 For all other destinations, Ciprofloxacin is the antibiotic of choice to treat travellers' diarrhoea. 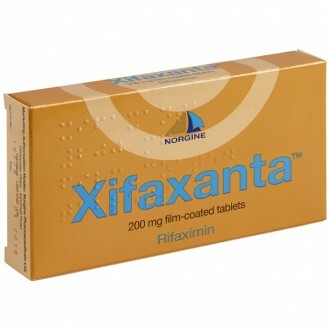 Xifaxanta can be used to treat travellers' diarrhoea for all destinations. Both ciprofloxacin, azithromycin, and rifamixin are short course antibiotics that will kill the causative bacteria and resolve most cases of traveller’s diarrhoea within 48 – 72 hours. Loperamide (Imodium) helps to absorb excess water from the bowels, easing the symptoms of diarrhoea whilst rehydration sachets will help to replace the lost water and electrolytes (salts and sugars) to keep you properly hydrated. In spite of all precautions one might still get diarrhoea because a mouthful of bathwater that you inadvertently swallowed. Even rinsing out your mouth with tap water can introduce the germs into your system. When you first experience travellers' diarrhoea it is important to start your antibiotics as soon as possible to treat the infection early. Adults can also take 2 loperamide to stop the diarrhoea whilst the antibiotics treat the infection. A further 1 loperamide capsule can be taken after each episode of diarrhoea until it stops, up to a maximum of 8 in a day. It is important to also drink plenty of clean water mixed with rehydration sachets. You should aim to drink 1 reconstituted rehydration sachet with every loose motion, up to five times daily. Can I prevent Travellers' Diarrhoea? Practising good hygiene is the best preventative measures when it comes to diarrhoea. This will help prevent spreading the infection that causes diarrhoea. Always ensure to wash your hands thoroughly after using the toilet and prior to preparing or eating food. If you’re already experiencing diarrhoea and wish to reduce the risk of passing the infection on to others then there are steps you can take. For example, cleaning the toilet, including the seat and handle with disinfectant after each episode of diarrhoea. Try to avoid sharing towels, flannels, cutlery and utensils with other people. If suffering with diarrhoea it is recommended not to take part in group activities until at least 48 hours after experiencing the last bout of diarrhoea. Canned or sealed products that have been produced by a recognised manufacturer. Fresh bread and unpeeled fruit. Food that has been freshly prepared such as stir-fries and soups are generally safe to consume. Sealed bottled water and juices, tea and coffee and alcohol are all considered low risk. As a precaution it is advised to, at least, take some loperamide and Dioralyte with you when travelling abroad, just in case. In some more simple cases travellers' diarrhoea can be treated with over-the-counter medicines. These medicines include Loperamide (Imodium) and re-hydration sachets (Dioralyte). Using these products together will help ease the symptoms, this will help as your body is trying to fight off the infection. You must also ensure you remain hydrated so take on as much fluids as possible during this time, as dehydration is the most dangerous consequence of Travellers' diarrhoea.